Habit at Enchanting Floral Gardens of Kula, Maui, Hawaii (USA). January 14, 2010. Origin and Habitat: Eastern Brazil. Habitat: It is an epiphyte (grows on other plants, but is not parasitic) native to tropical rain forests. 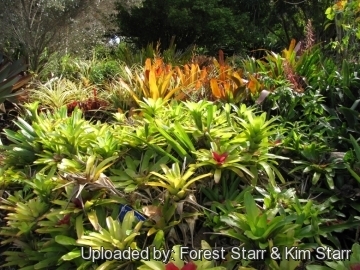 Description: Neoregelia carolinae is an evergreen herbaceous epiphytic bromeliad colloquially known as the blushing bromeliad. 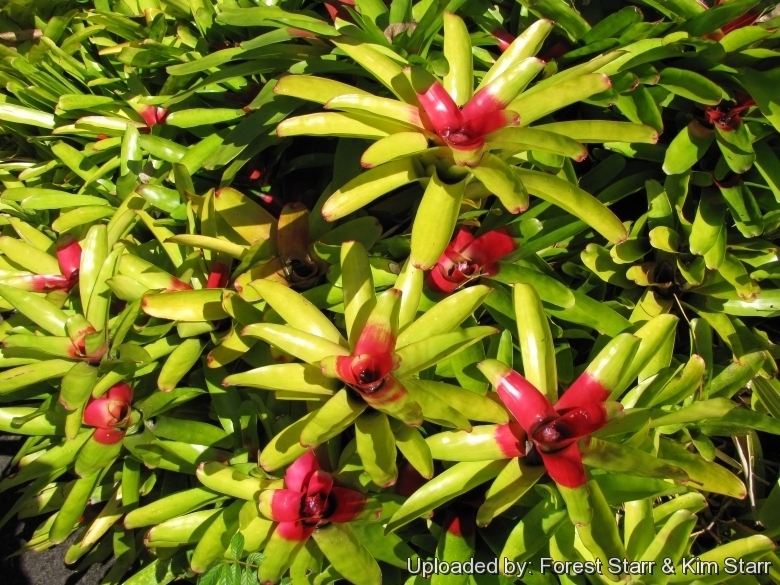 It does not have showy flowers like other bromeliads, instead it has a stunning brilliant red foliage at flowering time and lasting for some months afterwards. This one is a common species, that comes with many varieties. Stem: Nearly acaulescent or with a very short stocky stem. Rosettes: Funnel-shaped, spreading, broader than tall, about 20 cm tall and 35-60 cm across. The foliage of the rosette overlaps basally to forms a reservoir (phytotelma), in which rainfall and leaf litter can accumulate, allowing the plant to draw upon their water reservoir during periods of drought. Leaves: Narrow, ribbon-like, leathery, bent gracefully outward and then inward, up to 40 cm long and 2,5-3,5 cm wide, spine-tipped with somewhat densely toothed edges, hairless above, obscurely scaly beneath. Outer leaves are shiny glossy olive-green while the leaves surrounding the central cavity before the blossoming, become of a red colour near the base, which persist for about one year. Sheaths large, sparsely covered with minute, dark brown scales. Inflorescence: This species forms an extremely short raceme with many small white, violet or lavender flowers and appear in the socket centre of the leaf rosette that are placed at the same level and almost hidden at the bottom of the cavity that usually bloom in the water stored there. Flowers up to 4 cm long; sepals 1,6-2 cm long, asymmetric, basally connate, each rounded and with a small point; Petals2,4-2,8 cm long, basally connate to above the middle pinkish to blue. The flowers are guarded by showy red bracts that attract birds. Blooming season: Usually in cultivation it flowers in spring to summer. It is a monocarpic plant (bearing flower/fruit only one time during its existence) and a rosette usually reaches the flowering size in three to four years and then fade over a period of one years. Neoregelia carolinae (Beer) L.B.Sm. : has rosettes broader than tall, about 20 cm tall and 35-60 cm across and brilliant red foliage on the centre at flowering time. Distribution: Eastern Brazil. Neoregelia carolinae cv. Flandria: has creamy-white to pale yellow stripes along the leaf edges. Neoregelia carolinae cv. Meyendorf: has bright green leaves arranged in a rather flat rosette. During the flowering period the leaves in the centre change colour to a striking scarlet. Neoregelia carolinae cv. Tricolor: has creamy-white to pale yellow stripes along the leaf edges and closely resembles cv. Flandria. Neoregelia carolinae cv. Tricolor perfecta: has leaves with abundant yellow stripes, especially along the main vein. 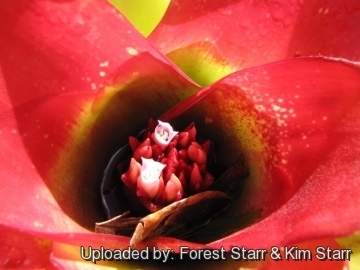 1) Forest & Kim Starr Neoregelia carolinae (blushing bromeliad). Plants of Hawaii. <http://www.starrenvironmental.com>. Downloaded on 16 Sep. 2014. 2) Wikipedia contributors. "Neoregelia carolinae." Wikipedia, The Free Encyclopedia. Wikipedia, The Free Encyclopedia, 20 Mar. 2013. Web. 17 Sep. 2014. Cultivation and Propagation: Neoregelia carolinae is a slow growing bromelid of remarkable ornamental value for the particular shape and colour of the foliage. As it is native to rainforests, cool evening temperatures with warm days and high humidity describes its best growing conditions, however it grows very well as a home plant too, where it is able to furnish a long lasting note of colour even in the dark corners. Individual plants live three to five years. 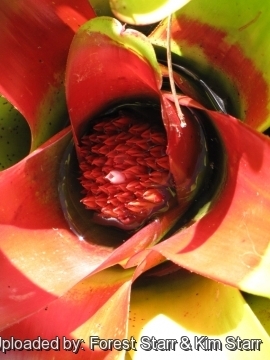 Growing substrate: This bromeliad is an epiphyte or saxicolous that in the wild typically grows soilless, but as a houseplant is typically grown in containers filled with light a well-drained, aerated, porous and moisture-retentive substratum which is rich of organic substance, but best results are obtained when it is grown epiphytically and roots are covered with moss or coarse crushed tree fern fibre encased in a container or wired to the surfaces of boulders, rough bark, rock walls, or tree branches. Living among the branches of the rainforests trees bromeliads need very little root space so do not place in too large a pot. Root rot can be a problem if the soil is too moist. 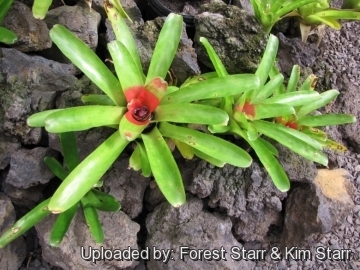 Continue to depot annually in the spring until the bromeliad fills a 10-15 cm pot. Small pots can induce blooms in mature plants It is easily transplanted; however, it can also be grown in a semi-shaded garden bed, where it will form big clumps. Exposition: Grow Neoregelia in bright filtered light both indoors and out. In the garden it prefers partially shaded areas and grow best where they'll get morning sun, or shifting shade throughout the day, but will not tolerate direct mid-day sun in hot summer climates. Low light often intensifies the bract colours that develop. In apartment, it is to be preferably placed in a luminous position, but it adapts also to situations of scarce luminosity. Watering: It enjoys constant moisture from rain or sprinkler. In dry and hot climate, humidity can be increased with nebulisations utilizing water at room temperature and not calcareous. In summer if the temperatures are over the 18°C, some distilled water can be left in the central cavity formed by the rosette of leaves, renewing it frequently to avoid the formation of a mosquito larvae nest, whilst with lower temperatures and in winter it is better to leave it dry, thus avoiding possible rottenness. In any case, it is good to avoid, immediately after the blossoming, the permanence of water, which would cause the rottenness of the residua of the flowers, with consequent unpleasant smell. Plants grow best with high humidity. Set container on a wet pebble tray in order to increase humidity. In presence of dry air and high temperatures, humidity can be incremented with nebulisations, utilizing de-mineralized water at room temperature and not calcareous, in order not to cause anti-aestethic dots on the leaves. Requires complete and perfect drainage. If you have one that is not flowering then keep very warm in the spring and water sparingly. To remove excess salt build-up, leach bromeliad pot once during the summer. Hardiness: It must be grown in a frost-free situation in open air in the tropical and humid subtropical climate countries, with temperatures which it is good to keep over the 14°C, best 20-24°C. Winter hardy to USDA Zones 10-11. 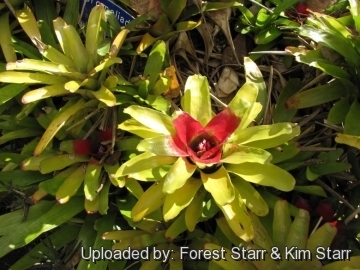 North of Zone 10, this bromeliad is grown in containers that must be overwintered indoors. Its foliage gets damaged already with temperatures just over the 0°C. Use: The plant, and even more its hybrids, can be cultivated as a house plant or patio container filler, or under tropical shade trees as a groundcover or accent. Propagation: Division. When the flower fades, pups appear from axillary gemmae between the leaves near the base of the plants. The offsets can be detached and repotted when they have reached the dimension of one third of the mother plant. Be sure to provide high humidity for a month after propagating the offsets. The reproduction by seed is usually kept for the hybridization. : remove seeds from inﬂorescence and lay them uncovered on a bed of crushed tree fern fibres; keep constantly but moderately moist. Starting from the seed, 5-6 years are needed for the blossoming, whilst at least 3 years are needed by division. The wide scale reproduction for commercial purposes is done by micro-propagation.